By the way, if you're on Facebook, join us there. We post even more links there simply because it's so easy to post as opposed to posting with Blogger. 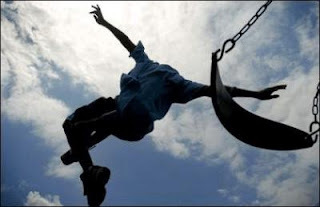 Who doesn't think the goofy, sharp, shin-burning playground equipment of their childhood was better than the rainbow-colored, soft-edged, plastic stuff kids have today? Here's a great Flickr photo pool of old playground equipment. You WILL see something you remember and forgot all about. Reading this Metafilter discussion of old playground equipment is like sitting around talking to your old grade-school buds. This Retrojunk essay sums it up nicely.